2014 has been the most amazing year for us. It was the year that my husband Trav and I decided that we didn’t need a permanent home anymore - we just needed a phone and a suitcase in order to live out our dream of travelling the world while at the same time still being able to be in contact with our loved ones. This was the year that we sold up, packed up, and took the leap to achieve our dreams. This time last year, Trav and I had just enjoyed our last Christmas and New Year in our cottage on a Scottish hillside where we had lived for the past 25 years. We originally bought the place as a derelict shepherd’s bothy and it had taken us a full 25 years to renovate it to the condition it was in when we sold it in January 2014! Over the years, among the renovating, rebuilding, plastering, extending and painting, our three sons grew up in something of a rural ideal. There were no visible neighbours in our remote part of the world but, typical of our Scottish lifestyle, we were still part of a strong village community and so we made lots of lovely friends and there was a good social life to be had. There was the village hall for harvest festivals, SWRI meetings and the like and, just six miles away from our tiny village is a slightly larger one, with a good school and some shops and a pub or two. Our boys spent their young lives with dogs and hens. Sledging down snowy slopes in the winter and playing freely in the countryside in the summer holidays, pitching tents and camping out in the forest opposite our cottage in true swallows and amazons style. The kitchen - before and after the 25 year long renovations..! With our boys all grown up and leaving home, there seemed little point in Trav and I staying in a family size nest. 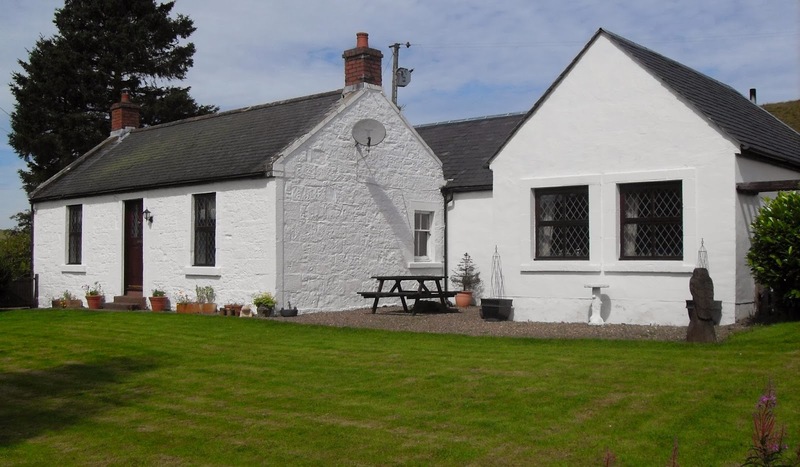 It was of course an emotional time for us when we put the cottage up for sale, as there were so many wonderful memories over so many years connected to the place, but we had a longing to travel and explore the world. Trav and I have always prioritised our one or two week holidays and mini-adventures over the years - which was probably why it took us 25 years to renovate the cottage - but this year we have made a real start on our traveling ambitions and by being careful with our budget and by planning our time, we've been fortunate to travel far and wide in 2014. 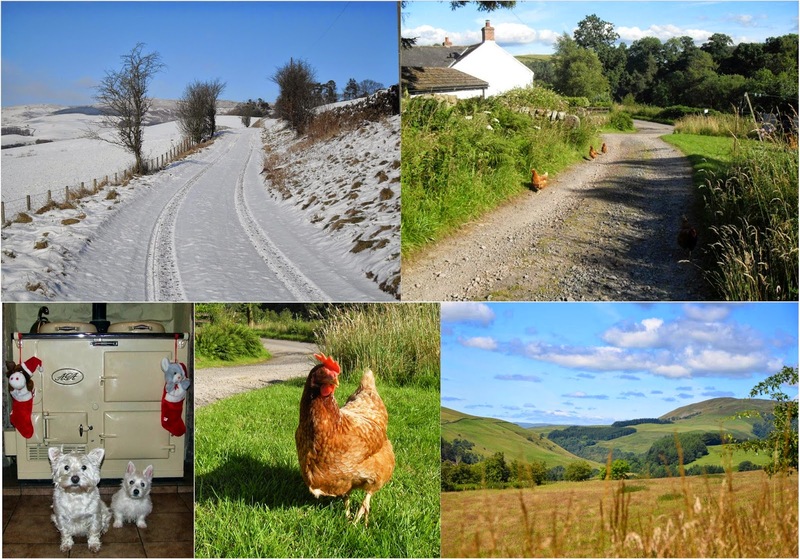 January: We packed up and moved out of our cottage and handed the keys over to the lovely couple who had bought it. 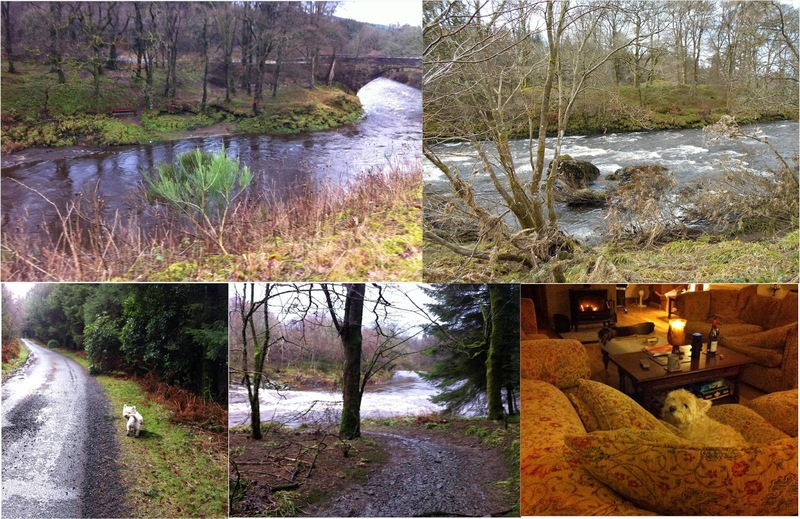 Staying in Scotland, we moved downhill to a rented lodge house by the side of the river. It was an equally beautiful place to live and I love the sound of the river rushing by and taking walks along the riverbank. 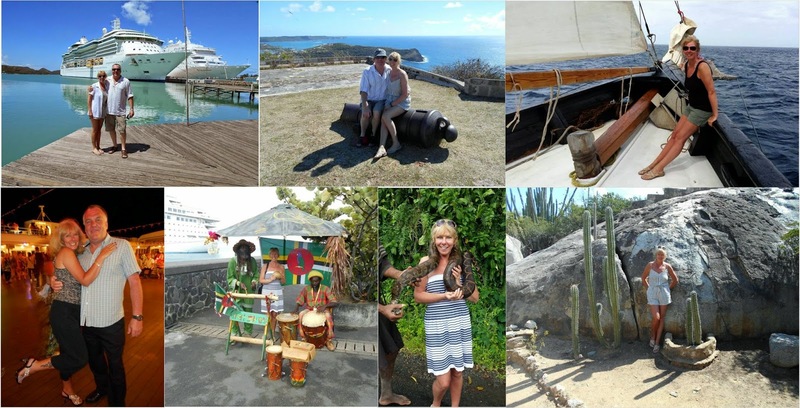 February: We grabbed a late-deal bargain Caribbean cruise and left for Barbados almost immediately. We flew on an airplane called a Dreamliner and the ship that we sailed the Caribbean on was called The Dream. It was all very dreamy and I had to pinch myself to find out if it was all real. Trav and I visited Barbados, Antigua, St Barths, Tortola in the British Virgin Islands, Grenada, St Vincent, the ABC islands of Aruba, Bonaire and Curacao. We spent my birthday in the lush tropical rain forests of Dominica. As we sailed away to our next port of call at sunset, I was treated to a birthday dinner celebration with Trav and the lovely new friends we'd met on-board, whom I hope will remain our friends for years to come. It was while we were sailing off Tortola in the British Virgin Islands that I decided to set my next novel there and had the idea for ‘Castaway in the Caribbean’ which is to be published in March 2015. March and April: Back in Scotland the weather had improved considerably and Spring flowers were blooming. We had family and friends to visit us and we enjoyed lots of lovely walks along the riverbank with our wee West Highland Terrier, Polly. 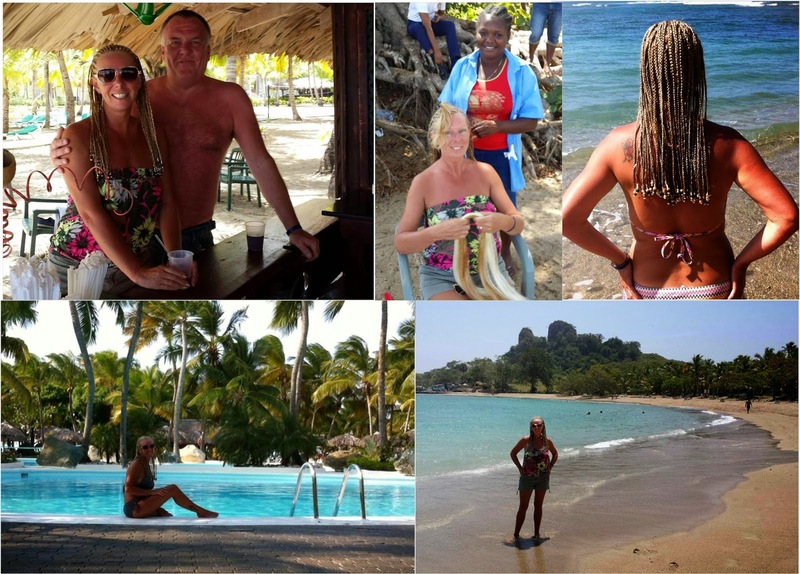 May: We grabbed another online bargain holiday and back to the Caribbean we went - this time to the Dominican Republic – a place we have been once before and we really love. While we were there I had my hair braided. What do you think? Boho-chic or Medusa...? June: No sooner were we back from the Dom Rep than we were packing our suitcases again in order to visit our Son #2 in South Korea. This was a very exciting trip and a very long journey. We flew with Emirate Airlines from Glasgow to Seoul via Dubai. You can read more about this fabulous country and our amazing adventures there in my blog post here. 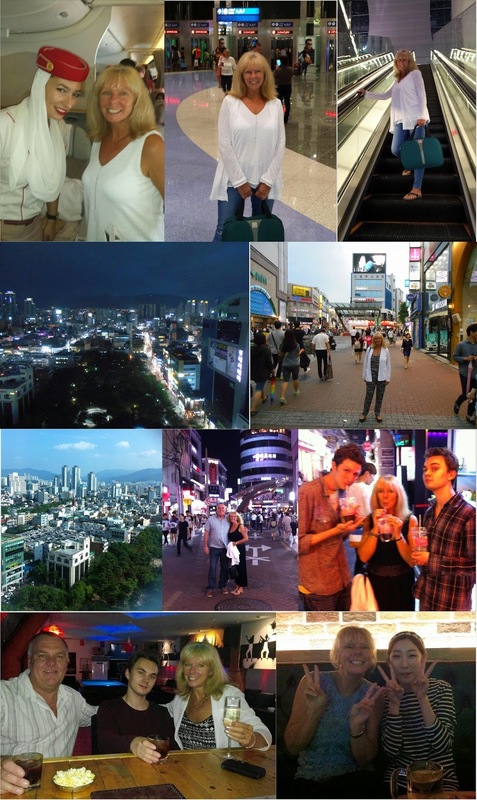 July: August: September: For three whole months in the summer of 2014, Trav and I took our most exciting trip ever. 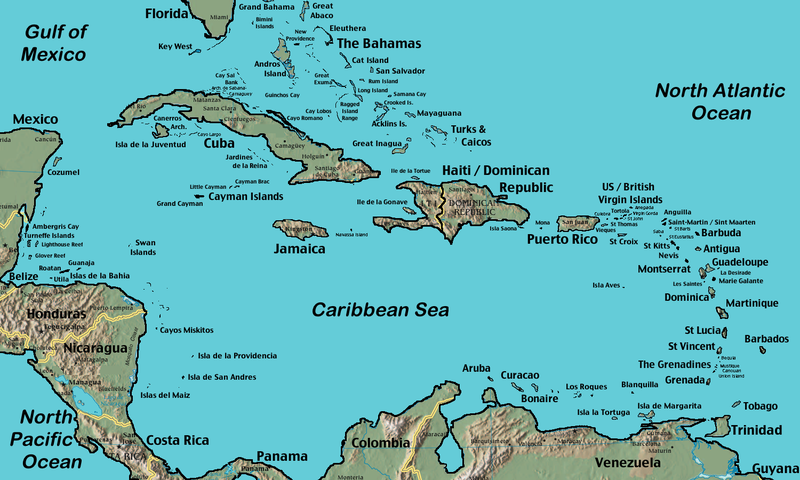 We flew from Glasgow to London and to Miami on our way to the Caribbean Island of Utila – the smaller of the Bay Islands off the coast of Honduras, South America. We went there for the scuba diving, as Trav has always wanted to swim with whale sharks. This was something he was able to do during our fabulous time on Utila, together with achieving his Dive Master qualification. Along the way, we had the most fun ever and we met some lovely new friends. 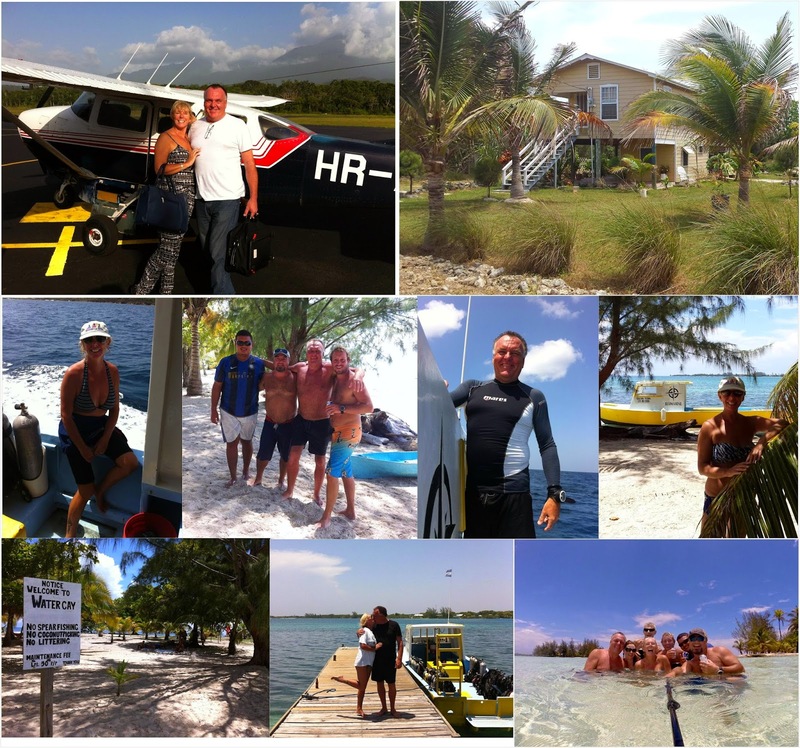 You can read more about our adventures on Utila here and in the following three blog posts too. Utila, Honduras - a paradise found! 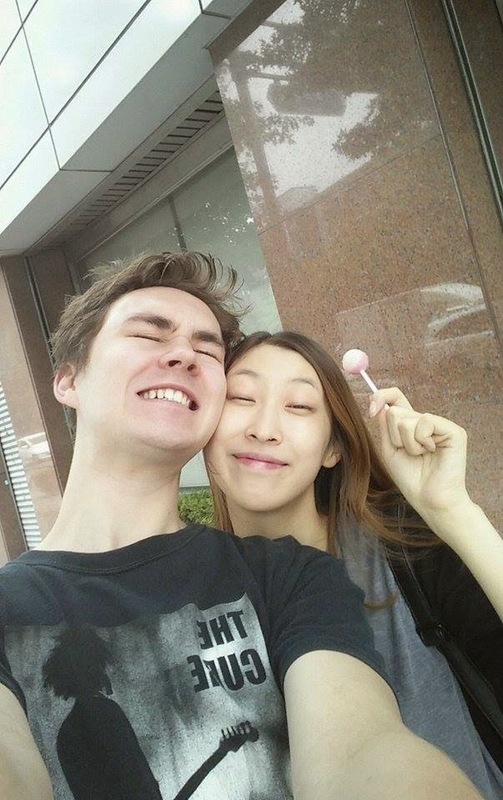 Also in September we heard the surprise news that our son in South Korea was getting married – on that very day. This is the official wedding photo of the happy couple. As you can see, they didn't stand on tradition as the groom wore his Cure t-shirt and the bride carried a lollipop. Young love!! October: We were home again to Scotland to see our family and catch up with friends. Son #3 picked us up from the airport as he had passed his driving test while we were away. He had decorated our bed at home and bought us presents to welcome us back. I think we were missed! November: Off to visit friends who live in the Kingdom of Bahrain. We traveled with Emirate Airlines again from Glasgow via Dubai. This was a fabulous and rather exotic trip. We got to catch up with our dear friends Sue and Pete and to go sightseeing and to live the life of ex-pats – if only for a short while! 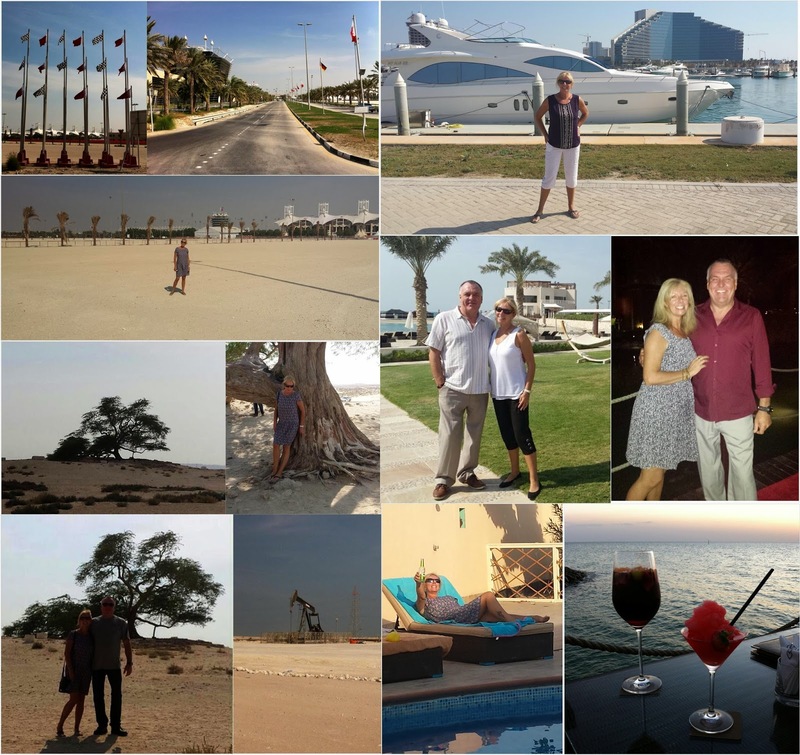 I've written a 'Snap Gap' feature on Bahrain for Loveahappyending Lifestyle Magazine and also a detailed blog post on the places we visited both in the city and the desert, which you can read here. 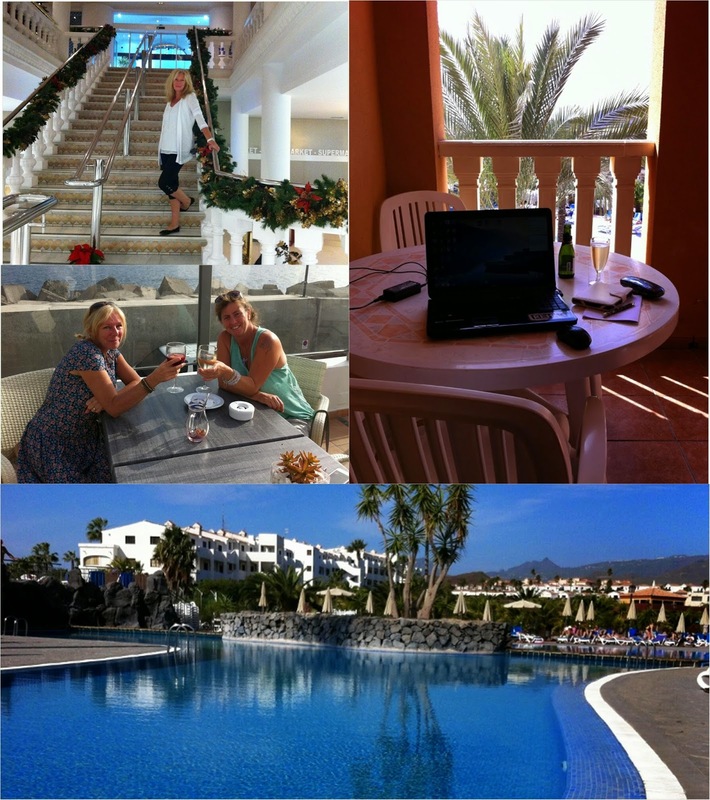 December: What better than a winter break in Tenerife in the Canary Islands? But this trip was all about work as well as pleasure as Trav was there to complete a dive instructor course and I was going to work on the edits for ‘Castaway in the Caribbean’. We did have lots of fun in the sun too of course and we also managed to catch up with friends we hadn't seen in a while. The Christmas decorations were up but the sun was shining in Tenerife as I managed to fit in work and catching up with friends. I had drinks with my friend Cami while Trav spent his days with Mary and Neil at Amarilla Divers. And the year to come? Well, I expect it will be even better than 2014…! You might be wondering how I can possibly say that when we have just had the most amazing year in 2014 – but you see in February 2015 our first grandson will be born in South Korea. Aaron Thomas Horton is due at the very end of February - probably while we are travelling in the opposite direction - as Trav and I are booked on a flight to America on the baby’s due date. However, we do plan to visit South Korea again in the summer of 2015 to get to see our son and his lovely wife and their new baby son. And that’s how I know that 2015 is going to be a fabulously fantastic year! I hope that your year is both fabulous and fantastic too and that all your dreams come true. 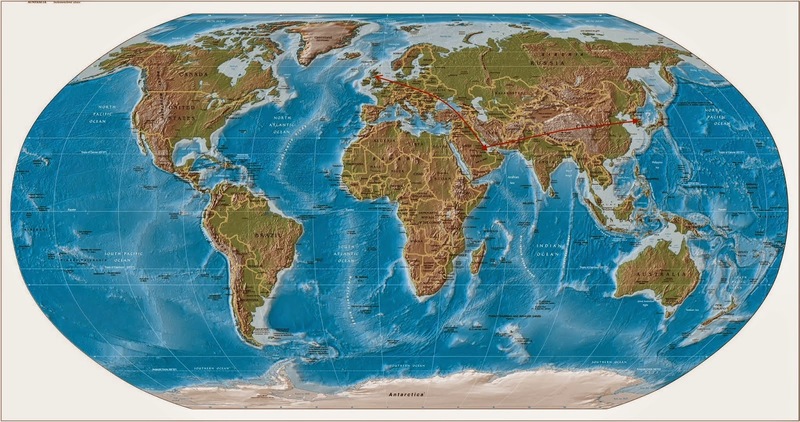 Please do follow my blog and pop back from time to time as I post from around the world. I love to read your comments and I promise to reply as soon as I get an internet connection. You can always catch me on Facebook and Twitter too, in the meantime. Do you keep a base in Scotland? A rented house, perhaps? Wow - what a truly fabulous year you had, Janice. The photos are stunning and you both look so well on your adventures. Wishing you much joy of your first grandchild and a healthy, happy and exciting 2015! Hi Kath (womagwriter) yes, we still have the rented house at the moment as our son is based there with our doggy. So we still have a Scottish base to come home to - just not a permanent residence - but who knows what the future holds?! Hi Rosemary - thank you - Trav and are are so looking forward to the birth of our first grandchild. Wishing you and your family a happy, healthy and exciting new year too. Hope you continue to enjoy your travels in the coming year and congratulations on the impending new arrival. How exciting!! I'm so glad we connected Janice! Your year has been so full of travel and excitement but when do you find time to write?? Lol. Wow, you must have an amazing amount of energy Missy! Happy New Year! Hi Pat - thanks for your lovely message. Yes, the thought of being a grandma IS very exciting - but I'm now wondering what do I choose to call myself to my grandson without sounding ancient!? All ideas and suggestions welcome! Hi Barb - thank you so much and Happy New Year! I'm glad we connected too and I love to see your posts on Facebook. I struggle to find the time to write because I'm easily distracted by 'other things' and I do have commitments in other areas too that often fight for priority time - like my magazine features and promotional posts for my books. I'm currently trying to finish 'Castaway in the Caribbean' and to get ahead of myself for April and May when I have two book tours for 'Castaway' happening. I find I have more determination than energy these days and often find myself exhausted!! What a fantastic year, Janice and how exciting that you and Trav will become grandparents this year. Thank you Sue - yes, we are thrilled and can't wait to meet our grandson! You two did have an amazing year! It was fun to follow along. Here's wishing you a great 2015, too! Thanks Kenneth. I'm looking forward to all the new adventures. Happy travels to you too! Thanks Vikki - I'm thrilled you loved to read my blog and thanks for your lovely comment. Happy 2015 to you and your family! You two are amazing! I hope you'll be writing a book about your travels, that is if you ever manage to touch down for long enough. Hi Rena and thanks for your lovely comment and also for the the Inspiring Blog Award! I'm on lock down at the moment - and for the next few days - while I finish the final edits on Castaway in the Caribbean and then just a few days later we are flying back to the Caribbean. It feels like it's been a long dark and cold winter here in Scotland! I promise to be back blogging and catching up with things again very soon - when normal blogging will resume. I read on your blog about your concerns that peeps aren't blogging as much as they used to - so I'm going to try and do more of it in 2015.